If it's even possible, I woke up achier than I was yesterday. I expected to be sore after the marathon, but wow--my body is not happy with me! I've done nothing but rest for two full days now, so I'm committing to getting back to walking in the afternoons after lunch. I think maybe moving around tomorrow will help loosen up my muscles so I don't gasp in pain every time I try to stand up. Oh, If you got a blog post notification this morning, I apologize. It was supposed to go live tomorrow rather than today, so it will be back up in the morning. It's the second "What's Beautiful" post (out of three). But anyway, I haven't done ANYTHING today. Jerry was off work, so he got the kids ready for school (which was a good thing, because I could barely move). I started to watch The Weight of the Nation, but I wasn't very interested in it. Usually I love watching shows like that. Maybe I'll give it another try when Jerry isn't home distracting me. Last night, Jerry and I watched the series finale of House. I was VERY disappointed in it. I thought the hallucinations were dumb. And the ending was completely predictable. I loved House, and watched it from the beginning, but I was not impressed with the finale. I'm kind of bummed because two of my shows ended (permanently) recently... House and Desperate Housewives. I'm starting to wonder what I'm going to do now. 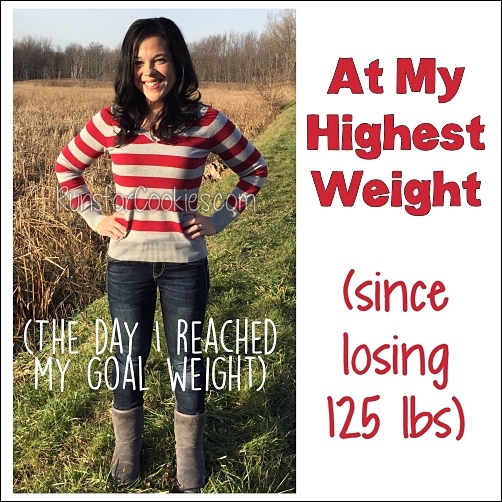 I know that my next "big goal" is to work at getting to my actual goal weight; but now that the marathon is done, I feel like I have so much free time! What did I used to do before I started training? Of course I will go back to running after giving my body a week to recover, but I'm not going to be running 35+ miles per week anymore. My next race is in a month--I'm running the Solstice Run 10-Mile on June 23rd. I've never done a 10-Mile run before, so I'm guaranteed a PR ;) I'm not going to be running it hard, though--at the end of June, I imagine it's going to be extremely hot. I've already proven I'm a baby when it comes to running in the heat! But I like having a race to train for, so that it makes me feel like I have something to accomplish. I'm not even going to follow a training schedule for the Solstice, because by the time I start running again, I'll only have three weeks until the race. 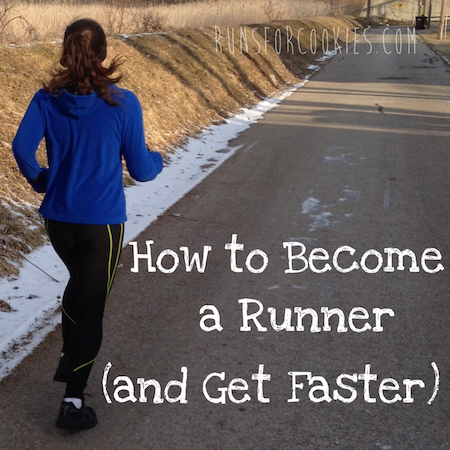 I'll just do a long run of 10-12 miles once a week and then do 2-3 shorter runs. I'd actually like to continue that through the summer, because then I will stay in "half-shape"... meaning I could just register for a half-marathon on a whim and be in shape to run it. 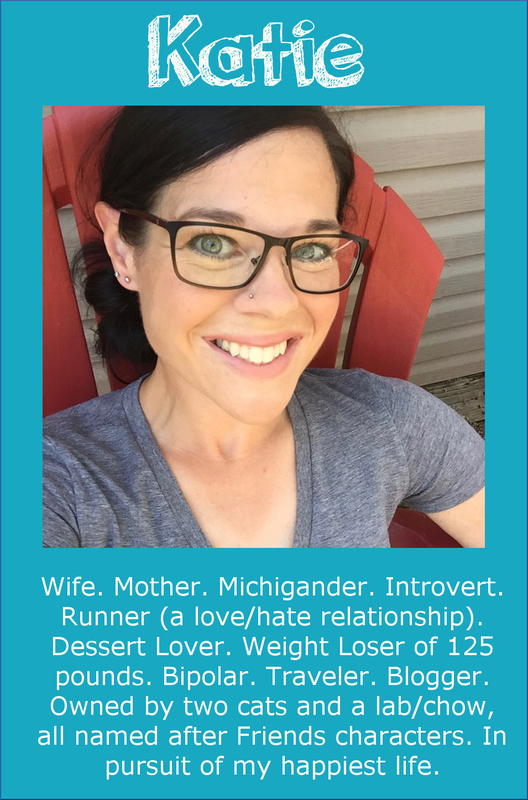 I'm running Women Rock MN on September 1st. I imagine that will be a hot one too, but I'm really looking forward to it! Renee and I are going to fly out to my brother's house (he lives in St. Paul, which is where the race is) and stay there for a few days. We are going to make a fun little trip out of it. I think (I hope!) that my brother's ex-wife is going to do the race with us too. It's been a while since I've seen her. That's another race that I'll probably just run for fun. Well, for not having anything to write about, this turned into a long post! I've got to get the kids ready for bed now. Hopefully tomorrow I will have something a little more interesting to write about! I've ran a 10 mile race before, and LOVED it! I think it'll be very fun for you, minus the heat. I watched the first part of weight of the nation and i was a little disappointed - i even got HBO again to watch it because I'm a health documentary fanatic and this had my name all over it. I thought it was just OK. I'll watch the rest of them and hope it picks up. A 10 mile run sounds kind of fun. 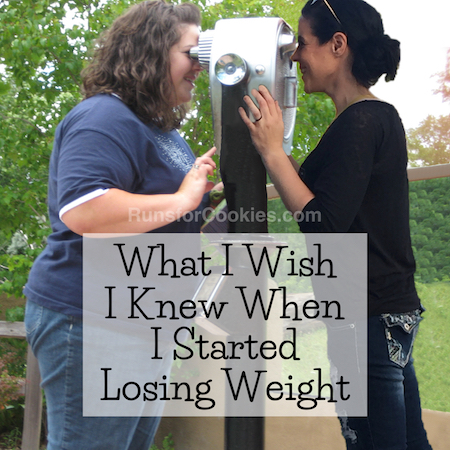 If you didn't see the episode where they follow 2 women who've lost a lot of weight and are in maintenance, keep watching! You and Katie will love that one. 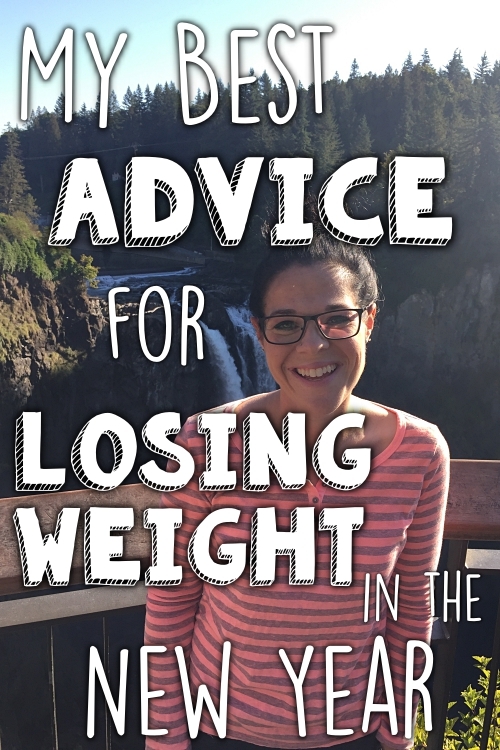 It talks about what's really necessary to keep the weight off, and one woman has BINDERS full of her food logs Katie! Right up your alley! Katie- I'm a long-time follower (through google reader) and this is my first comment- but I have to say I love your blog!! I think you'll really like 10 miles- it's just long enough that you really feel accomplished, but short enough that you won't get bored. In case you're interested, Philadelphia's Broad Street Run is in May every year- it's 10 miles all downhill (ok like .5% downhill) but a very very popular and a very fun race! Its about a 9 hour drive from the Detroit area to Philadelphia (I've done it many times) but there's a lot to do in the City of Brotherly Love- your boys would have fun here too. And as far as races go- Broad Street is relatively cheap- only about $30. Congratulations on your marathon!! If you do come to San Diego - I'd LOVE the opportunity to meet you - maybe even go for a run?!?! Hi Katie, I read your posts alot but never comment. I had to know though! So cool you are doing the Women Rock MN! I may be doing it also, but was nervous about doing a 10K, since I am new to running. 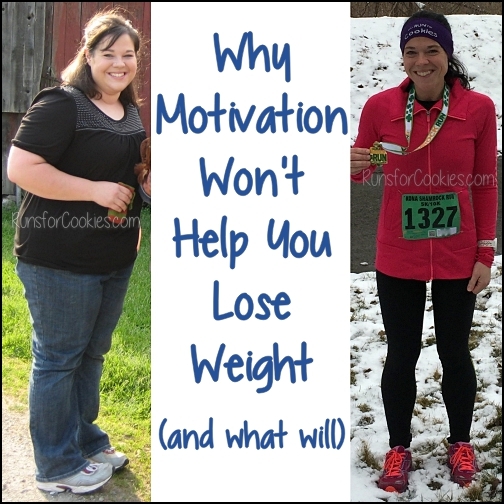 You may be the motivation I need!! OMG! 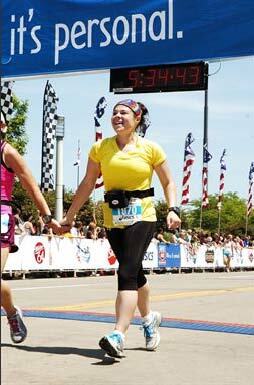 I am running the Women Rock in MN on Sept. 1 as well. It will be my 5th half and my cousin, Meg's first! Cannot WAIT! Anyway, hope you recover quickly from the marathon, Katie! P.S. Still have my Gocket. It really helps me stay on track. Thanks for that. Love that picture of you, Katie! The headbands you guys wore were really cute. A trainer friend of mine told me that that delay in muscle soreness is called DOMS I think (Delayed Onset Muscle Soreness). I've been there too! Take care. I've had a hard time with the last season of House. I quit watching around Christmas and am really bummed to hear it ended badly. I'll still finish it eventually though. I know that two days later soreness and it is awful. I have found that walking really helps with the pain so hopefully it helps you feel better. Enjoy the short break before your 10K training starts. I had a total blond moment reading your post today. I thought wow it must be beginners luck to PR your first race of that distance..... Then it hit me! Duh! No time to compete it with! Lol I got a good laugh at myself and thought you may enjoy my moment as well. I love documentaries about health and health-related issues, so I was excited for Weight of a Nation. The first episode is pretty dry and very science-y, but the second one is a lot lighter and far more interesting. The last 2 are okay as well, so my advice is either stick with it, or just skip the first episode entirely. Also, congratulations on your marathon....you are an inspiration! I can't imagine how sore you are! I was a big fan of Desperate Housewives too. I liked their finale. Enjoy your time off of running! If you're looking around, check out the Polder digital scale. They aren't too expensive - maybe $25 or so -- but are SO easy to use. You can put your plate on there, set it to zero and then measure ounces or grams directly onto the plate. Saves having to wash an extra bowl! Even when you have "nothing to say", I am still interestered! I am so proud of you for all your accomplishments (Man, I sound like a Mom!). I am just starting on my journey and right now it seems so daunting. Keep on going girl. The Women Rock sounds so fun! I really want to do a half, but I'm just not sure about training for that through the summer. The humidity just kills me!!! I've had some pretty sore muscles but can't imagine 'marathon sore'. Have you tried soaking in a tub with epson salts? It helps me when I am really achy. Definitely come to San Diego!! The Carlsbad Half in January is a GREAT course & the weather is good!! Have you tried an ice water bath? Even if you can't stand to soak, an icy shower helps immensely too. I hope you recover quickly. My DH is 6 weeks post his first marathon and is just now ready to run again. It really was a harder recovery than he expected. The prospect of running for fun sounds, well fun! I can't wait until I am there! Although mine is a WAYS off. :) Congrats again on your accomplishment!